As I was heading into the land of no internet (a beautiful, if slightly unsettling place in the Canadian Rockies) this weekend I received an email from my Technical Editor that she was done with my hoodie pattern. I wasn’t able to receive the files until this evening, which was excruciating. But now I’ve had a chance to look through it and I’m happy to announce it is ready to go. C says I should hold off until Tuesday since “that’s the day things get released,” but I’m unconvinced. Suffice it to say, within the next few days you will finally be able to get your hands on The Everyday Hoodie pattern! Since I’m officially going to have multiple patterns I have added a new page to the top of the blog. If you click on the “Patterns” tab at the top of the page you will be taken to a list of patterns I have for sale. Hopefully it will fill up quickly! When I first saw the pattern for Dahlia I knew I had to knit it. It’s such a beautiful design with a fun construction, not to mention very wearable. I found it while searching for something to knit for my sister. I knew from the beginning that it wasn’t necessarily her style, but I wanted to knit it so badly that I convinced her it was. I picked up some Mission Falls 136 at Knitting Addiction while visiting the Outer Banks with my family (vacationing on the Outer Banks is one of the perks of having family living in NC). I cast on as soon as I got home. and did manage to get gauge, but wasn’t completely thrilled with how it was knitting up. I finished the lace panel and made it through the whole body before I realized I was going to run out of yarn… yarn that had been discontinued. In the end I ripped it out and knit Jen a Lady Kina instead, which is much more her style anyway. Then, at The Loop‘s Boxing Day sale (can you tell I bought way too much yarn that day?) I picked up enough Pear Tree 4-Ply for 50% off to knit a Dahlia for myself. This yarn was absolutely perfect for it. I started the sweater anew and soon I was wearing my Dahlia everywhere. I wish that I had knit the front panels longer as I’d like to be able to overlap them and/or tuck one into the collar, but it’s still beautiful when worn with a shawl pin. I can see myself making another of these someday. And here we go! 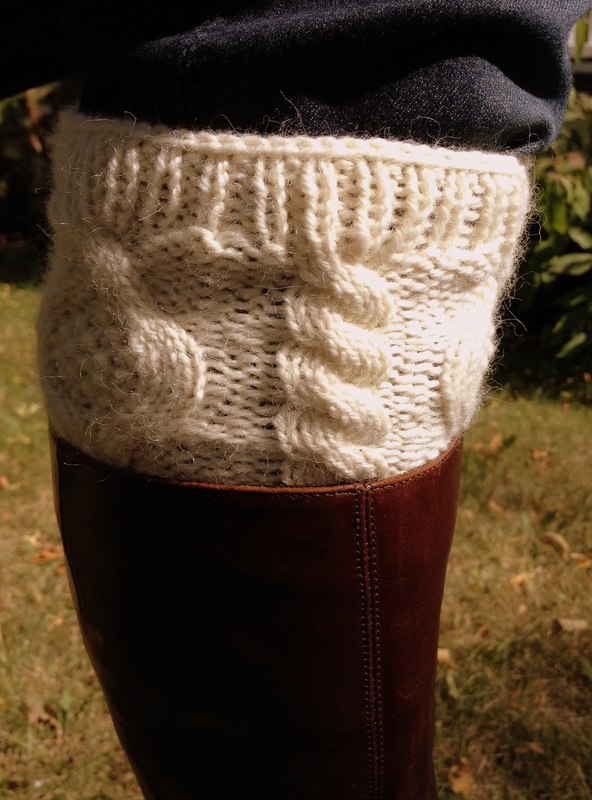 My very first published knitting pattern! It is a very simple design, but my own nonetheless! 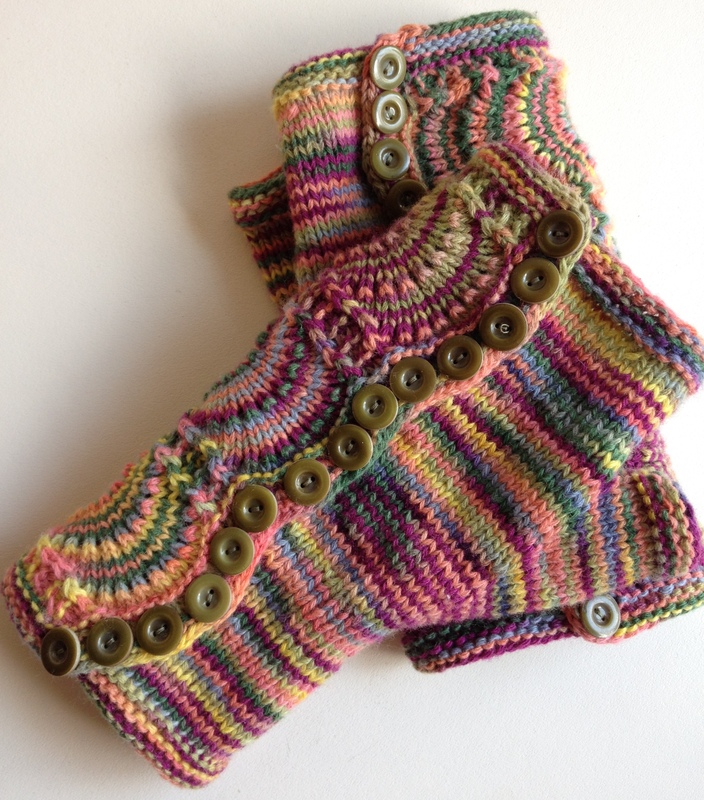 You can click on the Buy Now button below to go to the pattern page on Ravelry where you can purchase the pattern if your heart desires! Thank you to Eleanor Dixon for technical editing and Ryan Barr for photography! I am only using exclamation points to punctuate this post! This is what A used to say instead of “I’m excited.” I miss that little mispronunciation, it was a good one. Although I am sad summer is gone for another year, I must say “my ‘cited” about getting to wear my Spatterdashes again. 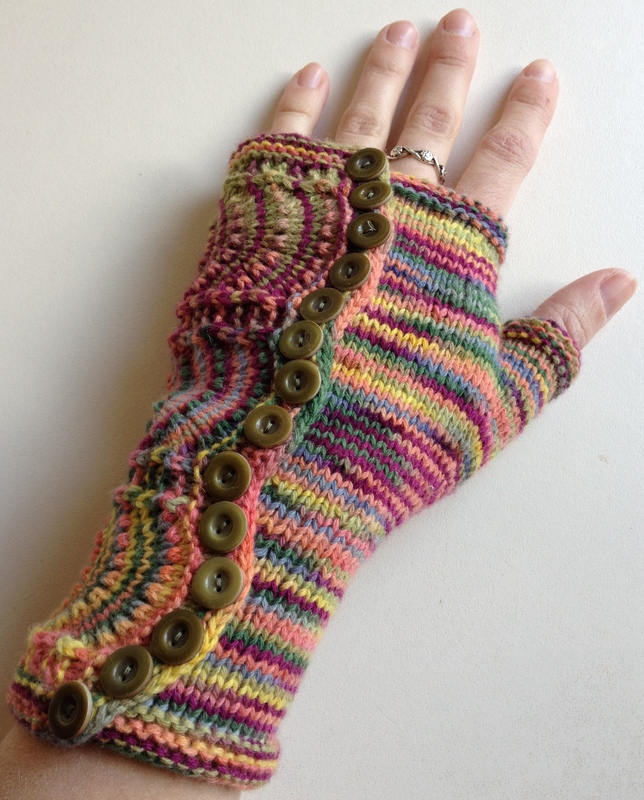 I knit these little fingerless mitts at the end of last winter and didn’t get to wear them much before the weather warmed up. I used a skein of Posh Yarn Lucia (Sock) in Hothouse that I got 1/2 price at The Loop‘s Boxing Day sale last year. I am a sucker for rainbow-y variegated yarn so this stuff was right up my alley, and this pattern from Knitty was the perfect match. It’s such a great pattern, just interesting enough, but not so much so that it’s not still TV knitting. The construction was very tidy with no seaming in the end. I managed to find 28 of the most perfect buttons at Suzy Q’s, my little secret button place in Inglewood. BUT, hot-damn! It’s really annoying sewing on 28 perfect little buttons. The finished product was well worth it, but I won’t be taking on this project again without taking a good hard look at how bad I really wanted them. … that I go on photoshoots now. Okay, so I must disclose that although I am the model, I am also the casting director and the client. 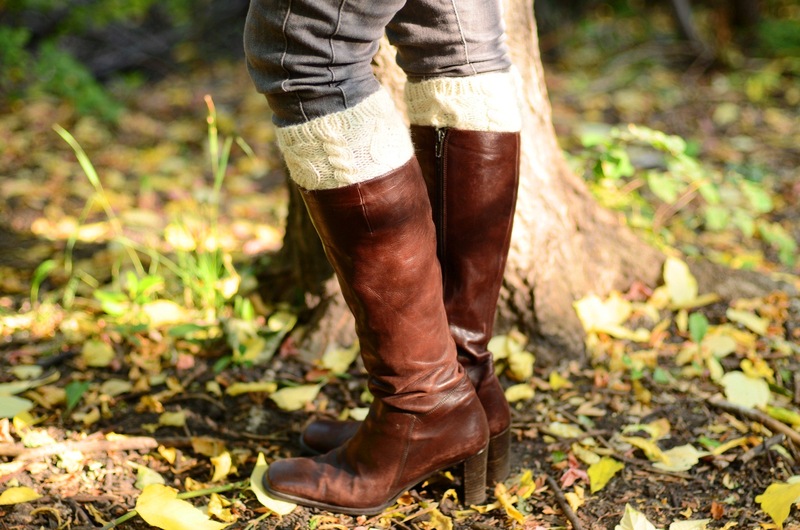 I enlisted my friend Ryan’s expertise again today to take some pictures of my new boot-cuff design. We headed to a park near his house and were able to find some beautiful trees and even a small stream for a backdrop. Just looking at what he got on his camera has made me very excited to see the finished product. Unfortunately I don’t think I’ll have the time to knit him another pair of socks for payment, but a case of beer will probably go over very well. Hopefully this business will take off and I’ll be able to pay him with actual money. In the meantime, the pattern has been tested quite successfully by 4 test knitters, and I should be getting it back from the technical editor sometime in the next week. Then I’ll just have to tidy it up, add the pictures and make any possible changes, and then you’ll finally get to see it. Yay!